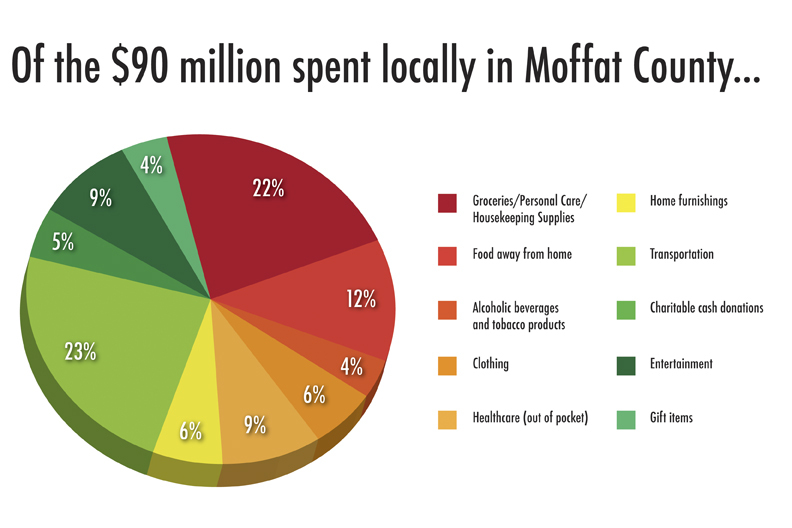 This graphic, based on data from the Yampa Valley Data Partners 2012 consumer preference study, breaks down where Moffat County residents spent their disposable income on a local level. — Scott Ford, a Steamboat Springs economic analyst and an advisor for Yampa Valley Data Partners, about Moffat County consumer spending trends. The Craig/Moffat Economic Development Partnership Board received the results of a 2012 Moffat County consumer preference report last week. The report, also known as a leakage study, was compiled by Kate Nowak, executive director of Yampa Valley Data Partners, and Scott Ford, a Steamboat Springs economic analyst and an advisor for YVDP. The purpose of the study was to determine where and on what types of products local residents decide to spend their disposable income, and the report yielded some surprising results. Ford and Nowak began compiling data for the study in late summer, which included mailing out 30-question surveys to 360 random households in Moffat County. YVDP received about 80 completed surveys, which ensures the data compiled is within the plus or minus 5 percent margin of error, Ford said. During the course of study Ford was able to determine that the total amount of disposable income available to Moffat County residents is about $270 million. Disposable income, Ford said, was calculated by taking a person’s gross annual income less state and federal taxes. Approximately 48 percent of those funds are dedicated to household spending, such as mortgages, utilities, insurance, pensions and education, the report states. Consumers therefore have greater control over how and where they spend their remaining 52 percent, or $118 million. YVDP decided to focus on 10 categories of consumer spending, including groceries, dining out, alcohol and tobacco products, clothing, out-of-pocket health care costs, home furnishings, transportation, charitable cash donations, entertainment, and gift items. YVDP then asked its survey participants where they spend the majority of their money for each category — in Moffat County, in Routt County, out of the area, or online. The survey did not expand on out-of-area locations because it’s irrelevant, Ford said. “Once it’s out of the area, it’s out of the area,” he said. Although Ford joked about the lack of local consumer spending taking place in Routt County, he did say the total amount of consumer leakage is not as bad as what EDP board members may have originally thought. Of the $118 million available in disposable income to Moffat County consumers. about 76 percent, or $89.7 million, is being spent locally. Seven percent, or $8.2 million, is leaking to Routt County; 12 percent, or $13.8 million, is being spent out of the area; and 5 percent, or $6.3 million, of local consumer spending is taking place online. Moffat County residents focus the bulk of their $28.3 million in out-of-town purchases on four main categories, Ford said. Residents are spending about $3.9 million of their out-of-pocket health care costs in Routt County. Though consumers use local businesses for their fuel and maintenance costs to the tune of about $20.6 million, Moffat County residents are spending almost $5 million on vehicle purchases out of the area. Entertainment, including recreational equipment and electronics purchases, also was a key area of consumer leakage, Ford said. Of the $13 million spent on entertainment, about $8 million stays in Moffat County. About $1.3 million, $1.8 million, and $1.9 million in entertainment purchases are spent in Routt County, out of the area, and online, respectively. But most surprising to Ford was the amount of charitable giving taking place online. Of the $6.3 million spent in online purchases, Moffat County residents are sending 33 percent, or more than $2 million, out of the area through online charitable cash donations. In comparison, about $4.5 million in charitable donations stays in Moffat County, while $820,000 goes up valley to Routt County and $828,000 is sent out of the area. Though Ford was careful not to discount the importance of charitable contributions regardless of where that money is sent, the fact that Moffat County residents are sending more than $3.6 million in cash to other parts of the state and country could be a concern for an organization like EDP whose mission is to promote local economic development. In addition to the qualitative data compiled by Ford, Nowak also organized two focus groups to ask why consumers are spending their disposable income out of the area in the first place. “The number one reason people are spending money outside of the area is because they are already out of town, whether that’s for visiting family or friends, seeing a show, or going to a sporting event,” Nowak said. “But selection and price also play a part in their decision to shop out of town. The YVDP consumer preference study has a shelf life of about 10 years, Ford said. To view the study, visit this story online at http://www.craigdailypress.com.